QSpray.com is the website of Quality Equipment & Spray. Our website strives to provide a wide selection of pest, weed, & landscape equipment. Our goal is to provide you not only with the equipment you need, but with the components, parts and repair kits you need to keep your equipment in service and making you money. We have been Pest & Landscape Equipment experts since our founding in 1993. We have designed this site to make it easy for you to find what you are looking for. Shop by department, category, brand or search bar. We are always adding more products. We stock 1000s of products that haven’t made it to the Qspray.com yet. If you need it , but don’t see it, email us or call at at (800) 675-7485. Our staff members are industry professionals and we have over 100 years experience with spray equipment. Our facilities are located in Phoenix, AZ. We ship most orders same or next day via Fedex. Hello, my name is Andrew Greess. 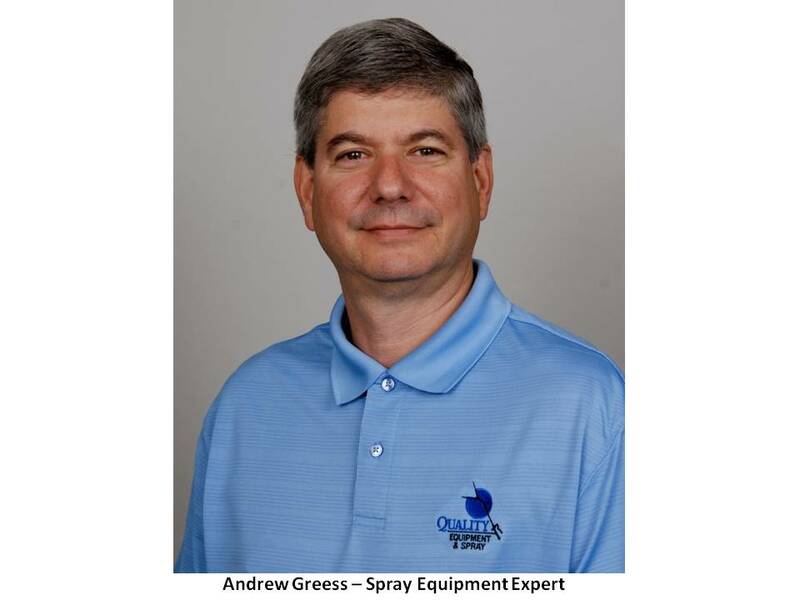 I am the president of Quality Equipment & Spray & our website, Qspray.com. This is who we are and what we believe. We believe that our customers, who are pest, weed & landscape professionals, need quality equipment to do their jobs and service their customers. Their equipment is a tool to help them pay the mortgage, feed their families and have the life they desire. They need equipment that allows them to do a great job in a minimum amount of time. They need equipment that doesn’t always break down. They need equipment that with a little care and maintenance will last a long time. Our customers need equipment that keeps them safe from hazards and chemicals, as well as protecting their employees and their customers. We strive every day to provide this level of equipment and support. We design and build our power sprayer rigs for maximum productivity, reliability, safety and ease of maintenance. Unlike other companies we don’t throw a sprayer together to hit the lowest cost. We think about what it will be like for the technician to use the sprayer every day, for the mechanic to repair it and for the company owner who is looking for long-lasting value. Many companies use plastic fittings. We use brass. It costs more, but it won’t break and ruin your day with a huge chemical spill. Our sprayer frames are welded on both sides for maximum durability. Our frames are raised so you can clean out the chemicals & debris that collects in your truck. You spend a lot of time and money building your company and your brand and you don’t need to bring it down by letting your customers see a filthy, smelly truck. We use heavier duty components than we need to because they last longer and have fewer problems. For example, we could get away with a cheaper or smaller engine, but we use the Honda GX160 5.5 HP commercial grade engine. With a little care it will last forever, it starts on the first pull, parts are readily available and any mechanic can service them. In fact, we are so confident that we build a great spray rig; we are the only sprayer company in the US to offer a full money back guarantee. We also stock the parts you need. There is nothing worse then having a piece of equipment down for weeks because you can’t find a $5 part. On our standard spray rigs, we stock every part, component or kit you will likely ever need. Again our philosophy is that downtime can kill productivity. We view it as our job to help keep you operating and productive. When it comes to other equipment besides power spray rigs we also have your back. We test equipment ourselves before we will sell it. Our staff has tons of industry experience. We want to make sure equipment works well, holds up to hard use and is relatively easy to service. For example, there are quite a few electric backpack sprayers out there. A couple are made by some of our favorite spray equipment vendors. Even though we carry lots of their other products, we won’t sell their electric backpacks because there are better products on the market. We not only sell the equipment, we stock the parts. For example, lots of folks sell Cox Reels, be we are the only company to stock all the parts you need to service and repair your reel. Lots of companies sell Birchmeier backpacks. We are the only company that stocks ALL the parts to service & repair the backpack. Not only that, when you call us with an issue, we have employees with dozens of years experience who can help trouble shoot your problem. Compare this to other companies that use telephone sales reps whose only job is to sell you something and wouldn’t know a Birchmeier from a Buick. Lots of companies sell B&G 1 gallon pest control sprayers & termite rods. We are the only company that stocks all the parts and all the tips for your vital equipment. We believe it is important that you can find all the equipment you need in one place to save time. We also provide other resources to help our customers stay productive and profitable. We have the industry’s only book on equipment strategy, we have dozens of articles and checklists to help you run your business and manage your equipment. One more thing. Unlike some of the big websites out there, like “domyown”, we are not making a fortune selling our products to your customers, taking food out of your family’s mouth. We invest our money in providing great products at a fair price with excellent support. As you can tell, we don’t spend our money on fancy marketing and good looking spokesmodels. We have a dedicated staff that works hard on all these things every day. We hope you will give us a try. Thanks for reading and thanks for shopping with Quality Equipment & Qspray.com.